I n the murky half-light that comes just before the sun rises, you can see a gentle chop to the rolling sea, with inviting lines of white water lapping eagerly against the slippery rocks. A chill still pervades the dawn, but in no time at all the sun will begin to rise – the secret here is to get fishing as fast as you can and take advantage of this time. Slightly fumbling fingers just about manage to clip on a popper, and that first cast arcs out into the gloom, to land somewhere out of sight in front of you. Click the bale-arm back over and begin that subtle but persuasive snap back of the wrist to get the popper spitting water to awaken the sleepy bass. Perhaps 30 yards out and you can make out the lure doing its stuff, but be careful to avoid hooking up on that big rock. Bass, though, love to lurk behind rocks, so make sure you cover this exact area again. The second cast flies out. You retrieve the popper so it begins a line towards the back of the rock, and then nearly fall off your own perch as a fish suddenly swirls right behind the lure, but misses it. Keep calm (easier said than done, especially when I am fishing), keep retrieving and make that lure dance. The fish hasn’t been pricked, so it will attack again. A split second before your popper hooks up on the rock, a fish swirls right over the top of the lure and everything suddenly goes satisfyingly tight. The rod kicks, the fish splashes on the surface and line peels off the reel. It’s hard not to shout your head off with pure joy as you hook up and engage. Hell, why not? It’s first light, so scream like a madman. I do! 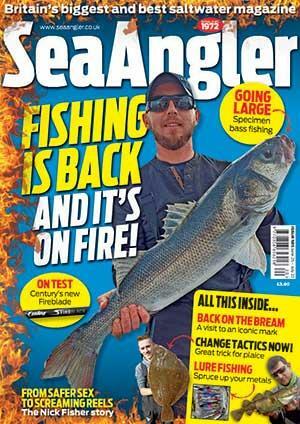 Welcome to the most exciting form of fishing on Earth – top water lure fishing. Put bass and surface lures together and in my view you have reached the pinnacle of European light-tackle fishing. There’s nothing complicated about using surface lures, and as far as I can work out, it is something of an inexact science. There are guys out there who know far more than I do about top water bass fishing, and while sub-surface lures are arguably the most historically successful overall for bass, popping is another world. It is accepted that warmer water helps for top water action – that’s why this style of fishing is more successful later in the season – but remember that a lure that does not sink allows you to fish nastier, rougher and shallower areas that the bass love. First and last light are good times to fish surface lures, and especially the period before the sun comes up. I reckon you can almost wake bass up sometimes by using a noisy, splashy popper. It’s happened too many times to be a coincidence. It is vitally important that you work surface lures hard, and by that I mean this is not the kind of fishing for the angler who likes to sit back and simply crank back and forth. Surface lures come alive because you make them, and this involves you working your rod and reel continuously, sometimes for long periods. It’s well worth it when a bass nails your lure. It is far more efficient to work surface lures with fast action plugging rods. Their stiffer tips and braid mainline’s lack of stretch make it far easier to get the lures disco dancing over the surface. The style isn’t powered by rocket science. Not only do stiff-tip spinning rods work the lures more efficiently, but they are far less tiring on the arms and wrist. A popper does what it says on the box – as you retrieve it by snapping the rod tip back repeatedly, it pops and spits water. Use either a low or high rod, whichever is the more comfortable for you. Poppers make varying amounts of noise and disturbance, and as far as surface lures go they are the most stable in choppier conditions. Some anglers mistakenly believe that surface lures are to be used only when the conditions are flat calm, but a popper works best when the sea is a little lively. Its stability and relentless action can help bring the fish up to the surface, and the accuracy with which you can fish them really helps to fish tight areas where the bass often lurk. If the popper does not feel right on the retrieve and is behaving strangely, it has most likely turned over in flight and the trebles have caught your line. Wind in and check – this does happen from time to time. ■ Storm Chug-Bug – one of the most popular poppers and still going strong, but more modern poppers cast better. ■ Halco Roosta popper – hard to track down, but casts like a bullet and is very stable. ■ Tackle House Feed Popper (right) – a quieter popper with no internal rattles. Good, subtle action. ■ Lucky Craft G-Splash – an all-time classic popper lure. ■ Maria Pop Queen – Maria makes great lures, full stop! A walk the dog lure requires that you systematically work the rod tip back and forth while jerking the reel handle in time to virtually make the lure ‘walk’ across the surface in a zigzag motion. It takes a bit of practice to master and it is tiring on the wrists, but it is a hypnotic way to fish. A true walk the dog lure is best fished in relatively calm conditions, for they are easily knocked off their stride in a chop. They tend to be more effective when fished at a slow to medium pace. The biggest lure-caught bass I have ever seen came on a walk the dog lure, the famous Lucky Craft Sammy. ■ Lucky Craft Sammy (right) – a real favourite. ■ Owner Tango Dancer – casts very well, lovely action. ■ Xorus Asturie – not easy to find, but popular for calm conditions. ■ Zenith Z-Claw – again, not easy to find, but a modern bass classic in the making. The third kind of surface lure is what I call a hybrid surface lure – a cross between a popper and a walk the dog lure. These hybrids are walked instead of popped, but while they walk from side to side in that zigzag motion they also spit and pop. These lures are more stable than a walk the dog lure and can be used in choppier conditions. If you had to name the most popular and arguably successful bass surface lure, then I reckon a hybrid is it. Work them at the same pace as you would for a walk the dog lure, and straight away you will notice the difference. Lures like this are appealing to the bass in a variety of different ways and I use them with a huge degree of confidence. ■ Yo-Zuri Mag Popper – one of the most popular and successful hybrid surface lures. Still excellent, but more modern lures cast further and cover a bit more ground. ■ Xorus Patchinko – one of the new breed of surface lures for bass. Casts like a bullet and fishes like a dream. ■ Lucky Craft Gun Fish (below) – a classic among bass freaks. I know some anglers who swear that this is the only surface lure you will ever need when bass fishing.